Like a codger lecturing his grandson about the way things were “back in my day,” Martin Scorsese's first film for children (and 3-D) is a journey traversing cinema’s early history. The ironic brilliance of Hugo is that Scorsese appropriates the en vogue visual technology of today’s movies to preserve that history and venerate pioneers of the medium. Adapted from Brian Selznick’s 2007 book The Invention of Hugo Cabret, the eponymous orphan (played by Asa Butterfield) lives in secret behind the walls of a 1930s Paris train station (the Gare Montparnasse, although nameless in the film). After the death of his horologist father (Jude Law in flashback), Hugo is adopted by his drunkard uncle and conscripted into a life spent tending the station’s intricate system of clocks, a job Hugo alone eventually assumes under the nose of the station’s fastidious inspector (Sacha Baron Cohen). Along the way, Scorsese peruses the relationships between the station’s denizens with Altmanesque flair, the camera drifting amongst the assortment of artisans, merchants and musicians. One such trader is Georges Méliès (Ben Kingsley), a cantankerous toy salesman who discovers Hugo has been stealing parts in order to complete an unfinished clockwork automaton left to the boy by his father. 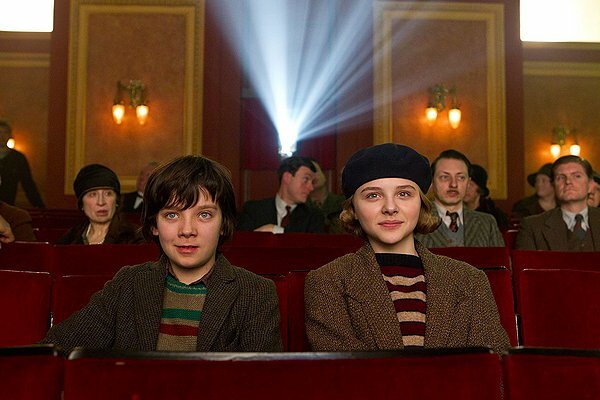 With the help of Isabelle (Chloe Grace Moretz), Méliès’ goddaughter and a bookworm with a proclivity for big words, Hugo discovers that the old toymaker is actually the renowned, real-life French filmmaker famous for his early use of special effects and one of the first to marry cinema with fantasy. However, most of Méliès’ films would be lost or destroyed in the wake of World War I. Now a broken, bitter man, Méliès fights to forget his past at the same time Hugo discovers the wonders of film, starting when he and Isabelle sneak into a screening of 1923’s Safety Last, with its iconic shot of Harold Lloyd dangling from a clock. Scorsese and cinematographer Robert Richardson craft a vivid universe and employ cutting-edge visuals to illuminate a couple of rail sequences: a dreamscape re-creation of the famous 1895 derailment at Gare Montparnasse, and a rendering of the Lumiere brothers’ 1897 Arrival of a Train at La Ciotat that exploits 3-D to produce the sensation of audiences of the era who, according to legend, felt the train coming straight at them. The symbolism is heavy throughout – the incessant clock motif juxtaposes mortality with art’s timelessness, while the automaton embodies man’s impulse to, like God, create in his own image. Hugo succeeds most, however, as an advert for cinephilia and Scorsese’s important film preservation effort. It springs life when recounting Méliès’ salad days of blazing cinematic trails on makeshift sets, celebrating the joy of moviemaking and its rightful place as a true art form. Otherwise, there’s a mechanical feel to the tableau, as if it’s missing a few key components needed to complete the enchanting kids movie it augurs to be. Hugo forgets the fact that a youngster’s first love of cinema is sparked by thrills and wonderment, not a dissertation. After all, despite Scorsese’s beatification, Méliès’ movies were nonetheless the stuff of mermaids, space aliens and fire-breathing dragons.